The Freedom From Religion Foundation is appalled at President Trump's extreme pandering to evangelicals and his degrading treatment of nonbelieving Americans at his weekend commencement speech at Liberty University. America has always been the land of dreams because America is a nation of true believers. When the pilgrims landed at Plymouth, they prayed. When the founders wrote the Declaration of Independence, they invoked our creator four times, because in America we don't worship government, we worship God. That is why our elected officials put their hands on the Bible and say, "So help me God," as they take the oath of office. It is why our currency proudly declares, "In God we trust," and it's why we proudly proclaim that we are one nation under God every time we say the pledge of allegiance. • "America is a nation of true believers." 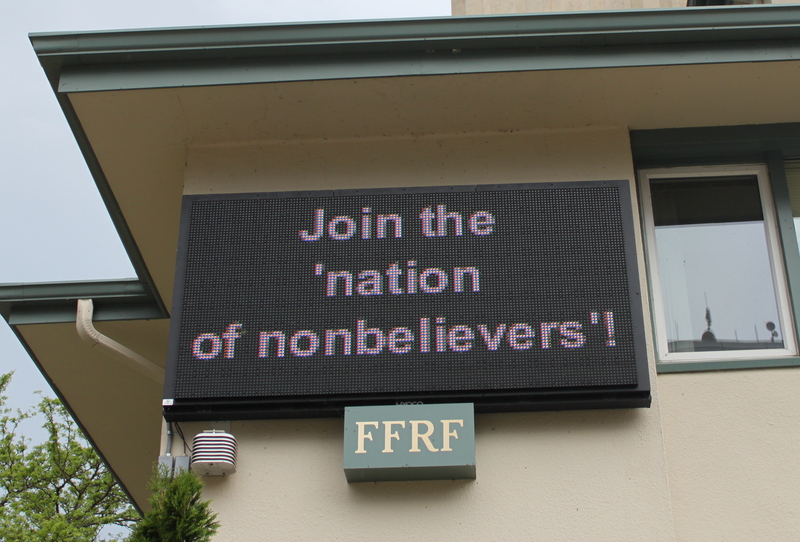 Calling America "a nation of true believers" is as patently false as it is exclusionary to us nonbelievers. Overall, nearly a quarter of adult Americans identify as nonreligious — making the "Nones" the fastest-growing identification in America. Another 7 percent are non-Christians (and one assumes would not qualify as "true believers," practicing a minority religion). Over a third of Millennials are nonreligious. That's an unforgiveable number of Americans for our president to ignore, dismiss, deny and shut out. • "When the pilgrims landed at Plymouth, they prayed." Fewer than half of the 102 Mayﬂower passengers in 1620 were "Pilgrims" seeking religious freedom. The ﬁrst colony of English-speaking Europeans was Jamestown, settled in 1609 for trade, not religious freedom. The secular United States of America was formed more than a century and a half later, and the founders adopted a godless Constitution. If tradition requires us to return to the views of a few early settlers, why not adopt the polytheistic and natural beliefs of the Native Americans, the true founders of the continent at least 12,000 years earlier? • "When the founders wrote the Declaration of Independence, they invoked our creator four times ..."
The references to "Nature's God," "Creator," and "Divine Providence" in the Declaration do not endorse Christianity. Thomas Jefferson, its author, was a Deist, opposed to orthodox Christianity and the supernatural and a target of his day's Religious Right. The declaration's purpose was to "dissolve the political bands," not to set up a religious nation. Its authority was based on the idea that "governments are instituted among men, deriving their just powers from the consent of the governed," which is contrary to the biblical concept of rule by divine authority. It deals with laws, taxation, representation, war, immigration and so on, never discussing religion at all. • "... because in America we don't worship government, we worship God." This is the most odious of Trump's pandering statements. "We" Americans include many citizens who eschew any worship. But what is so dismaying is Trump's implication that America is — or ought to be — a theocracy. We don't want or expect Trump to "worship" the U.S. Constitution, but he ought to realize it sets up an entirely secular government. • "That is why our elected officials put their hands on the Bible and say, 'So help me God,' as they take the oath of office." FFRF wrote Trump as president-elect, as we write all presidents-elect, urging him not to place his hand on a bible or recite "So help me God," thereby following the dictates of the Constitution he would take an oath to uphold. The framers of the Constitution believed the wording of the oath of office for the president was important that they included it in the Constitution itself. Article II, Section I makes no reference to a bible or holy book. It's tampering with the oath to add the words "So help me God," which are not part of the dictated oath. The framers conscientiously provided for the option of affirming, cognizant that for many unorthodox, the word "oath" would be distasteful. • "It is why our currency proudly declares, 'In God we trust.'" Likewise, Congress mandated at the height of the Cold War that "In God We Trust" appear on all currency only in 1955, and it was absent from paper currency prior to 1957. (It appeared on some coins earlier, as did other sundry phrases, such as "Mind Your Business.") "In God We Trust" was belatedly adopted as our national motto in 1956. The original motto, "E Pluribus Unum," celebrating diversity, not theocracy, was chosen by a distinguished committee of Franklin, Adams and Jefferson, and was entirely secular. • "... it's why we proudly proclaim that we are one nation under God every time we say the pledge of allegiance." The words "under God," did not appear in the Pledge of Allegiance until 1954, when Congress, under the spell of McCarthyism, inserted them. Piety should not be considered synonymous with patriotism. Citizens should not be subjected to a religious test. • "And I must tell you I am so proud as your president to have helped you along over the past short period of time. ... I said I was going to do it, and, Jerry, I did it. ... we did some very important signings." As FFRF's lawsuit over the executive order made clear, Trump is purposefully working to give evangelical Christianity unrestrained power to use its tax-exempt coffers, programs and property to buy votes and undermine elections — and, ultimately, our secular republic. That is why the work of the Freedom From Religion Foundation is more important than ever.